President Donald Trump mischaracterized the plight of children who were taken from parents at the Mexico border and what's known about Russia's interference in the 2016 election investigation in his wide-ranging interview with The Associated Press. The facts: He's actually failed to achieve changes in immigration laws. All of the immigration-related changes pushed by his administration were done by executive order, not legislation, or through policy shifts like the zero-tolerance policy that criminally prosecuted anyone caught crossing illegally and gave rise to family separations. The administration has also used regulations to tighten the rules on how immigrants can receive public benefits. Immigration legislation has failed despite Republican control of the White House and both houses of Congress. The facts: Obama did not do the same thing as a matter of policy. It's true the underlying laws were the same. But the Trump administration mandated anyone caught crossing the border illegally was to be criminally prosecuted. The policy meant adults were taken to court for criminal proceedings, and their children were separated and sent into the care of the Health and Human Services Department, which is tasked with caring for unaccompanied migrant children. The so-called zero-tolerance policy remains in effect, but Trump signed an executive order June 20 that stopped separations. 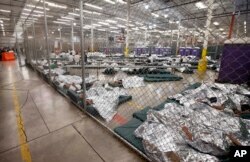 FILE - Detainees sleep and watch television in a holding cell where hundreds of mostly Central American immigrant children are being processed and held at the U.S. Customs and Border Protection Nogales Placement Center in Arizona, June 18, 2014. ​Trump: "And in fact the picture of children living in cages that was taken in 2014 was a picture of President Obama's administration and the way they handled children. They had the kids living in cages. They thought it was our administration and they used it, and then unbeknownst to them and the fake news they found out, 'Oh my God, this is a terrible situation.' This was during the Obama administration." FILE - From left, former FBI Director Robert Mueller, named special prosecutor to the investigation of Russia's involvement in the 2016 U.S. presidential election, and President Donald Trump. ​The facts: Trump may be right that he did not need a boost in Idaho and Iowa, states he won in 2016 with comfortable margins of 31 points and 9 points, respectively. But the notion of Russia-backed activities on his behalf "anywhere else" in the U.S. is not far-fetched, according to an indictment in February by special counsel Robert Mueller.